When I was working with brushos on my impermeable craft mat recently I swiped a piece of watercolour paper through some blue paint just to clear it up. I set it aside to dry then decided it would make a suitable background for this sweet little birdhouse scene. Even though I used hot pressed watercolour paper it still has some texture so I used my stamp positioner to stamp the scene several times in versafine ink. I pulled out my polychromos pencils to do the colouring. As I was adding colour over a blue background, I wanted the opacity of the polychromos rather than the transparency of watercolour pencils. 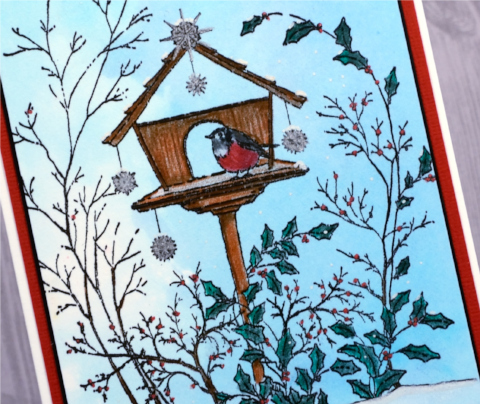 I used several browns for the birdhouse, red, white, black and grey for the bird, two greens for the leaves then switched over to gel pens. The berries are coloured with red, the snowflake decorations with silver and a bit of snow here and there with a white gel pen. In a few places I had obscured the black stamping with my colouring so I used a black micron pen to redraw some lines. I wavered on adding a sentiment then decided not to cover any of the picture or fill the one bit of blank space. I’ll put a greeting inside instead. I finished it off with two mats and stamped an envelope to match. 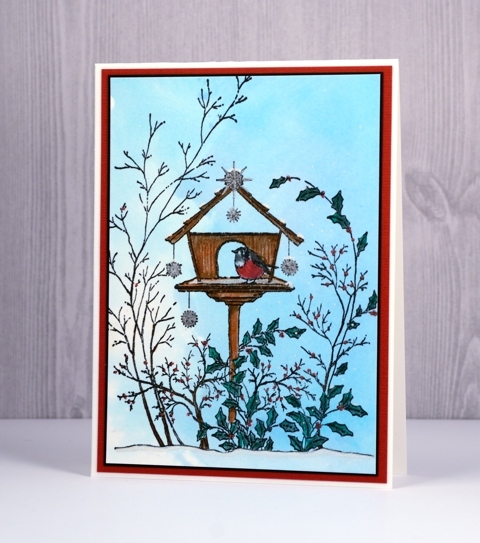 This stamp is part of the new Be Merry release from Penny Black which is now available in their online store. Check out the Penny Black blog for details on their giveaway. I love this! Absolutely beautiful! Thank you for the tutorial! adorable card. I always seem to forget that I can add gel pens to the mix. thanks for the reminder. Also, I think you were wise not to cover up the front. It would have looked good but taken away from the serenity of the scene.